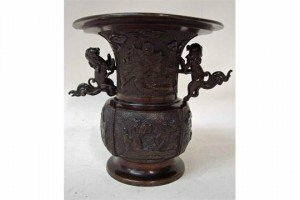 A Meiji period Japanese bronze vase, baluster form with wide flared circular rim, cast in relief with panels of figures and landscapes, twin detachable handles as mythological dogs. 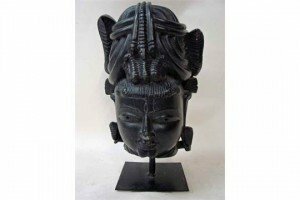 An antique carved stone head of a Goddess, black patinated, elaborate head dress featuring snakes, supported on later steel stand. 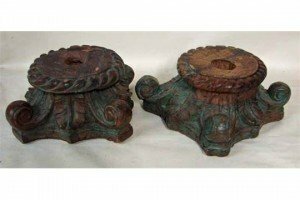 A pair of Chinese carved hardwood pedestals, circular rope edge top, four scroll feet on quadripartite base, possibly the bases or capitals from a pair of wooden columns. 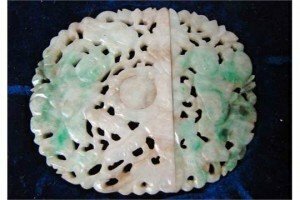 A late 19th/early 20th century Chinese jade belt buckle, of oval two piece form, carved and pierced decoration depicting two immortals, smooth polished to reverse. 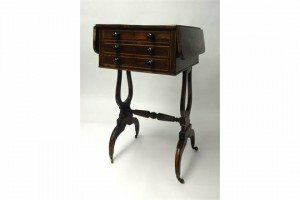 A 19th century rosewood Work Table, fitted with an arrangement of real and dummy drawers to the front and back on a lyre type base with arched legs and small original castors. 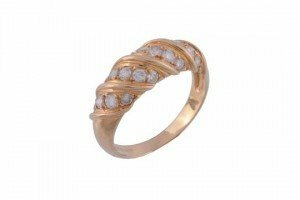 A diamond dress ring, the ring set with graduated diagonal rows of brilliant cut diamonds, 0.56 carats total, stamped 18kt. 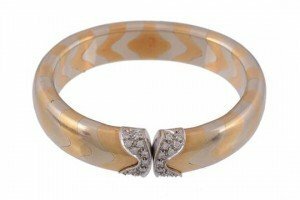 A diamond sprung bangle, composed of rounded chevron links, the terminals set with brilliant cut diamonds. 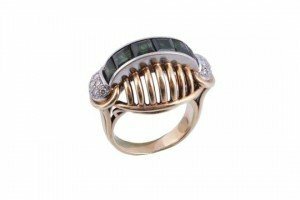 A 1950s tourmaline and diamond dress ring, the open basket shaped panel centrally channel set with step cut green tourmalines to eight cut diamond set D shaped panels, to a reeded shank. 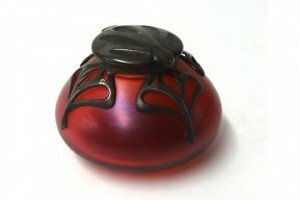 A coloured glass inkwell or scent bottle with Art Nouveau overlay pewter decoration , with embossed hinge lid. 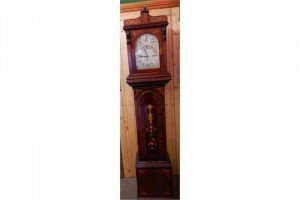 A mahogany and inlaid Bracket Clock, having silvered dial and three sub dials, with 8 day chiming movement, striking on a rack of gongs with Westminster chimes, on a long case stand. 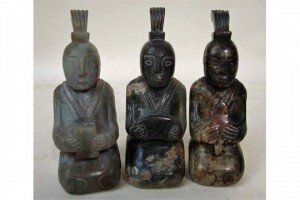 A set of three Chinese jade Funerary figures, as keeling attendants holding gifts, ranging in colour from mottled green to russet and brown. 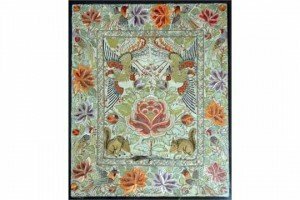 A Chinese silk embroidered panel of rectangular form, decorated on an ivory colour silk ground with a central rectangular panel depicting a pair of squirrels, flowering blossoms and a pair of exotic birds in flight within a border of flowering foliage, parrots, pheasants and other birds. 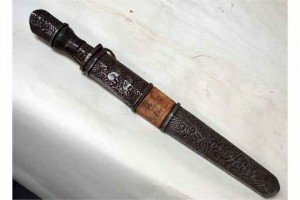 An oriental dagger, possibly late 19th century, white metal mounted hilt decorated with animals and foliage, white metal sheath similarly decorated. 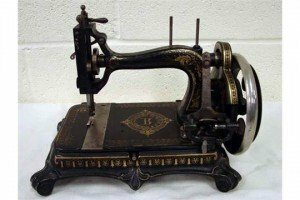 A 19th century Brunswick Atlas Model B sewing machine, set on a rounded rectangular base with scroll feet, gilt decorated. 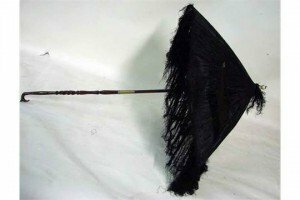 A late 19th century ladies small parasol, dark brown silk with loose tassels, folding carved wooden handle. 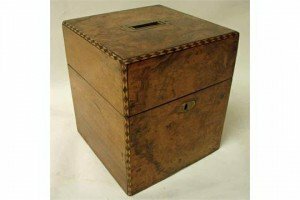 A Victorian burr walnut campaign decanter box, of typical square form with marquetry inlaid canted corners, hinged lid with recessed brass carry handle, internally fitted for two decanters with full width division in front. 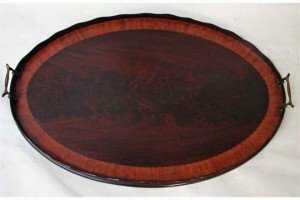 A 19th century flame mahogany serving tray, oval form with cross banded and inlaid border, shaped mahogany gallery and a pair of gilt metal handles. 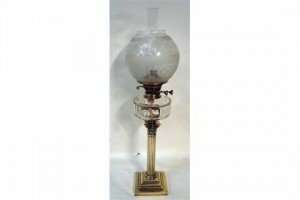 A Victorian brass oil lamp etched glass globe shade, clear glass drum shape reservoir with twin wick burner, set on a Corinthian style brass column on stepped square brass foot. 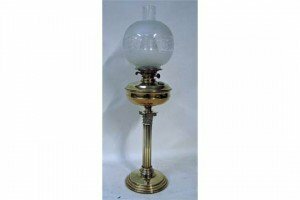 A Victorian brass oil lamp, etched glass globe shade, brass reservoir with duplex burner, set on a Corinthian style column support on stepped circular brass foot. 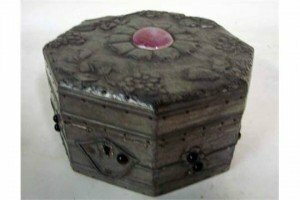 An Arts Nouveau wooden lidded box of octagonal form, all surfaces covered in pewter sheet, the hinged cover centrally set with a pink ceramic flower centre, surrounded by trailing leaves and blossoms, the sides with flower heads set with pink glass cabochons.